What's the appeal of a square orange? Place it on a table and it stays put. That's about it. 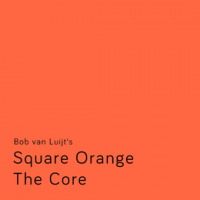 The musical equivalent, in the shape of Dutch bass guitarist Bob van Luijt's Square Orange, has much greater appeal. The quintet's debut album, The Core, features van Luijt's original compositions: a set with impressive stylistic range. The review copy of The Core was beautifully packaged in a distinctive black cover with a bright orange band. Information was scant, howeverthe musicians were named but it required some investigation to identify who plays what. Such a minimalist ethos isn't carried forward to the music, though: Square Orange has a real energy to its performances and the faster numbers are characterised by a full-on wall-of-sound approach. The title track opens with a funky keyboard riff then cranks things up even more with the soaring saxophone of Sjoerd Visser. Van Luijt's bass solo sets out his credentialsspeedy, flowing and precise, it grabs the attention from the first bar. The band's gentler side is displayed on the romantic "I Will Think Of You." More accurately, the tune displays van Luijt's gentler sidea solo acoustic performance which showcases his ability to turn the bass into a melodic front-line instrument. The three-part "Red Moon Suite" is at the heart of The Core. Inspired by the bassist's love of sci-fi, the suite imagines a journey into the far reaches of space. The first part, "Red Moon SuiteTravel," is the most ambitious section. It gives each of the musicians the chance to stretch out as the 20-minute tune moves between fast-driving fusion sections, reflective slow passages, dreamlike exchanges between soprano saxophone and keyboards and a closing section with a distinctively New Age feel. Throughout, Van Luijt and drummer Yonga Sun take control of rhythm and pace with some outstanding interplay. "Arrival" opens with a blues-meets-prog dynamic, locked in by van Luijt's bass so that Sun can take a freer approach to his percussion. Eventually the New Age feel resurfaces, calming things down before the players gradually rebuild pace and add layers of sound to create a funky closing section. "Home" seems to signal a welcome sense of contentment, with each of the quintet giving performances of controlled beauty. The Core is an enjoyable slice of sound. If a square orange is this much fun, just how amazing would a groovy orange be? Track Listing: The Core; I Will Think Of You; Red Moon Suite – Travel; Red Moon Suite – Arrival; Red Moon Suite – Home. Personnel: Bob van Luijt: fretless bass guitars; Sjoerd Visser: saxophones; Florian Weber: piano; Raoul van Herpen: synthesiser, Wurlitzer, clavinet; Yonga Sun: drums.